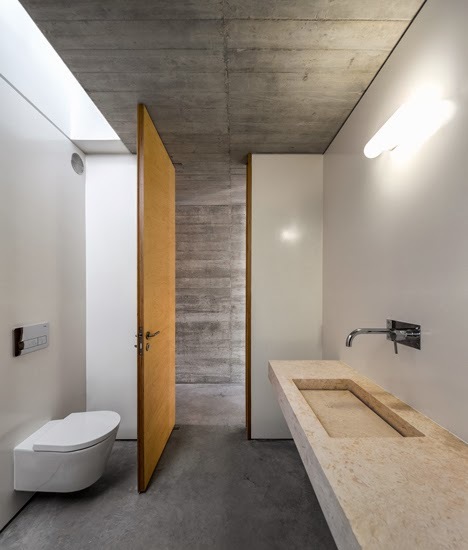 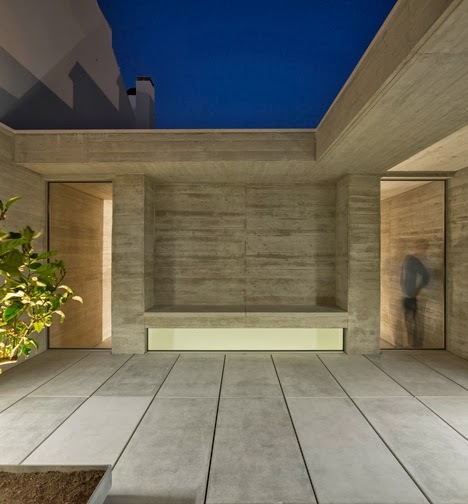 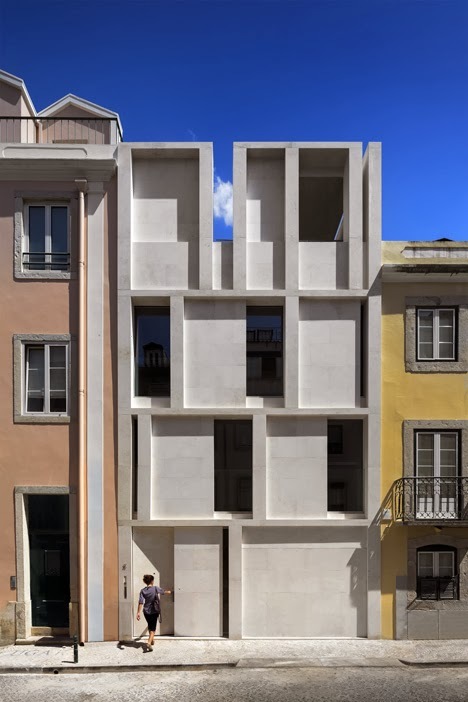 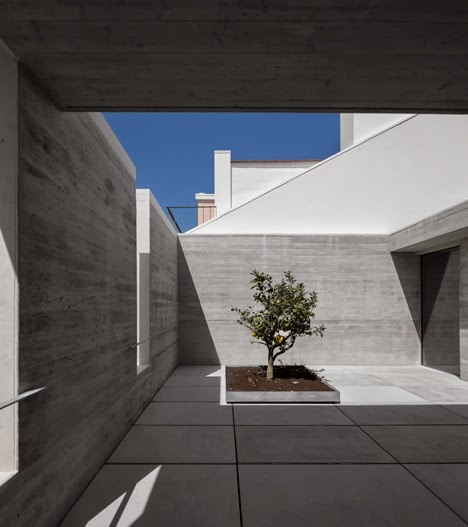 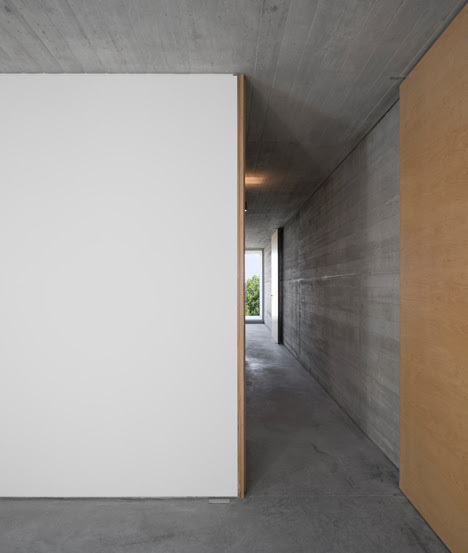 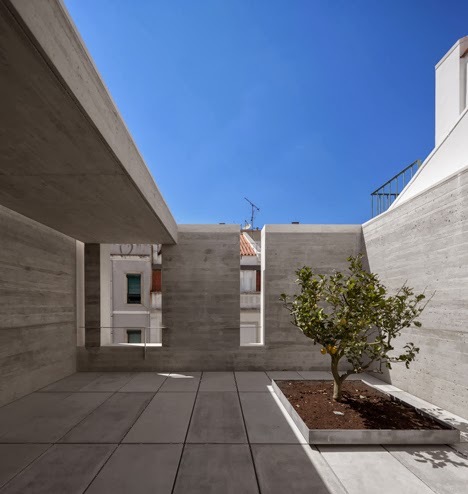 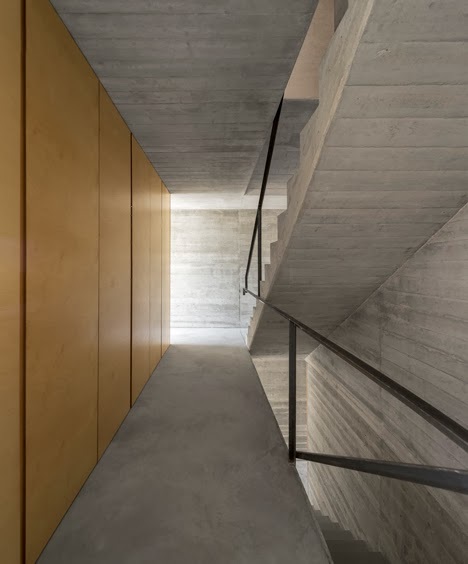 This townhouse in Lisbon, Portugal, designed by ARX Portugal features a white limestone sculptural facade and a raw concrete, minimalist interior. 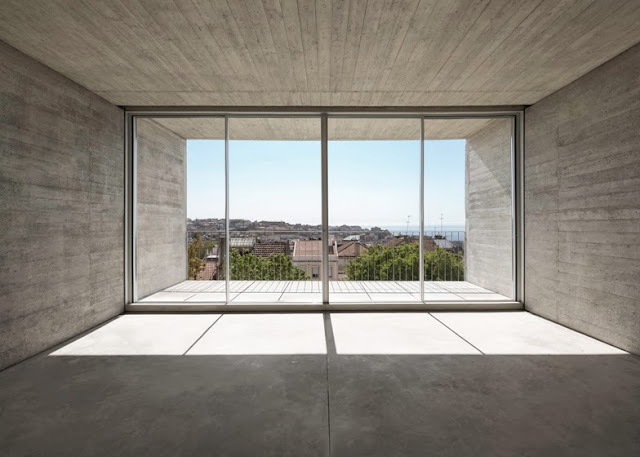 The front elevation windows follow a rhythmic nature that creates different light and shade effects throughout the day. 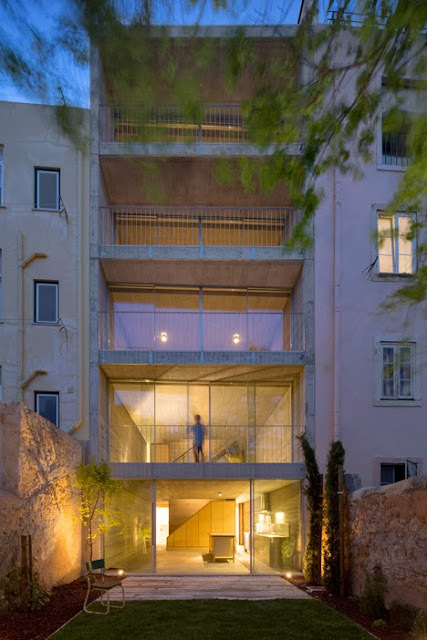 On the contrary, the rear elevation is transparent, consisting of large openings and balconies overlooking a secluded garden. The residence is arranged in five levels of great fluidity and openness, offering the sense of a generous space. 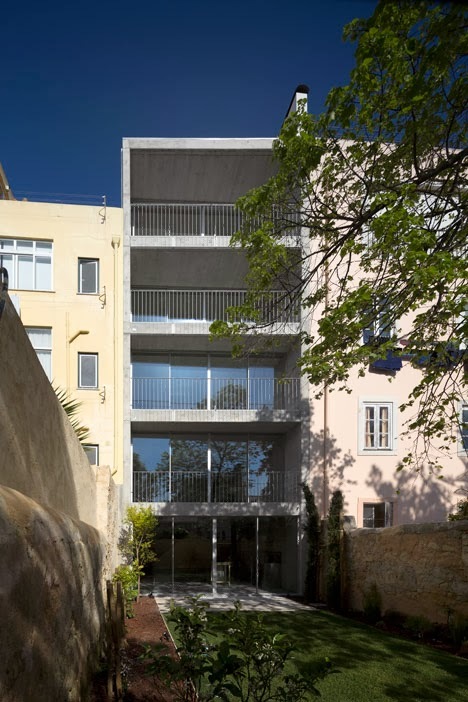 The concept for this house emerges from a reflection on the identity of Lisbon architecture, a recurring type of 6-metre-wide and 15-meter-long deep house, ending in a small garden in the back. It is a 5-storey building with two radically different elevations: one "public" in white lioz limestone (the most used in Lisbon) and the one in the back, in glass, connected by an interior world in exposed concrete, punctuated by birch wood elements. 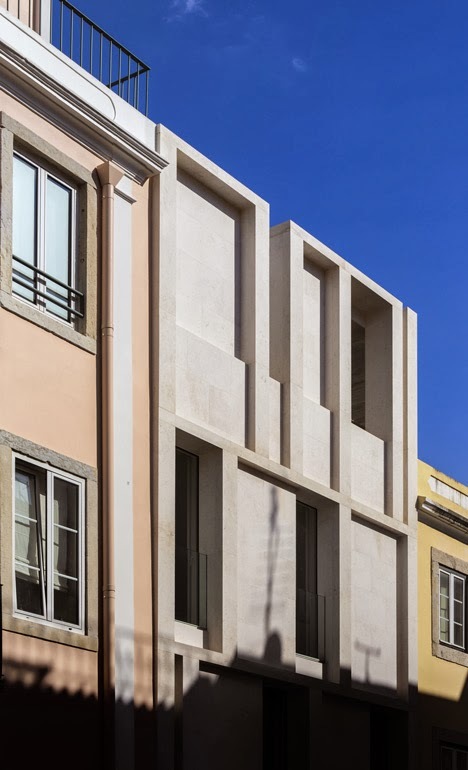 The elevation obviously follows on the Lisbon tradition, stressed further by the windows' rhythmic structure, opened in a span system created by horizontal strips and vertical bars - characteristic of the city architecture. Just as most of Lisbon's old buildings, it is a flat elevation whose expressiveness comes from its rhythmic nature and the light-and-shade effects produced with the backing-up of its surfaces. 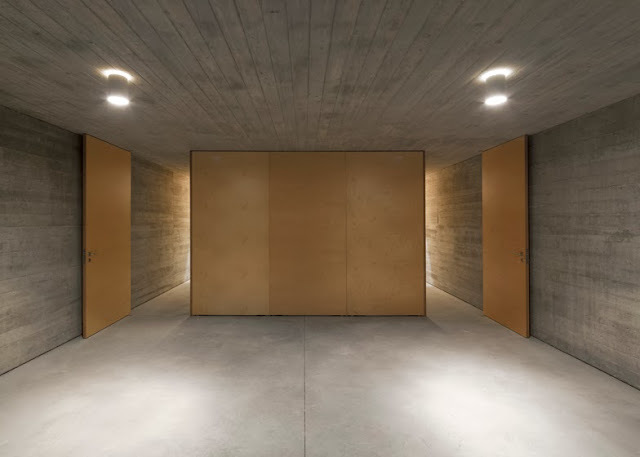 This apparatus brings the elevation a sense of time, expressed by the change in the shadows throughout the day: from a more subtle morning light - with no direct sunlight - to the strong contrasting afternoon shadows. 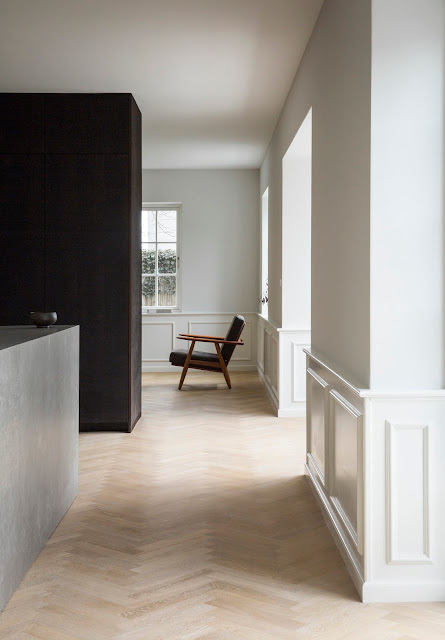 Besides a straightforward concern in aligning the elevation with the surrounding lines, the design stresses an obvious contrast between the block-type bottom, and the more dematerialised crest. 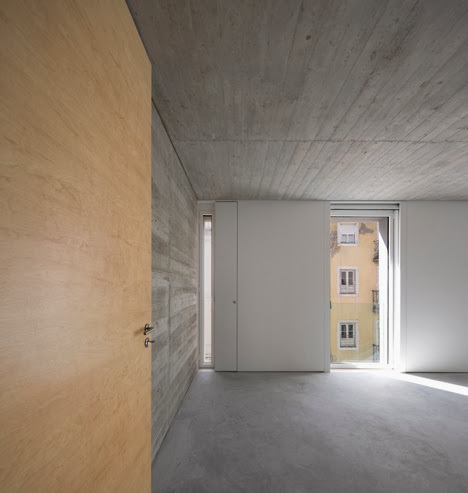 If on the one hand the ground floor responds defensively to the narrowness of the street, combined with the fact that neighbours park their cars in front of doors and windows, on the other hand the top comes out much lighter and dematerialised: it is a space at once interior and exterior - a top patio allowing the transition between the lower building, to the south, and the higher one, to the north. Nevertheless, despite its intimate nature, the space allows a view over the surrounding landscape and to the far-off Christ the King statue to the south, along the street line. 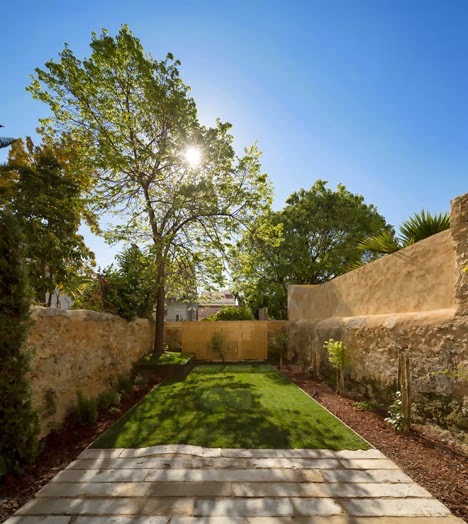 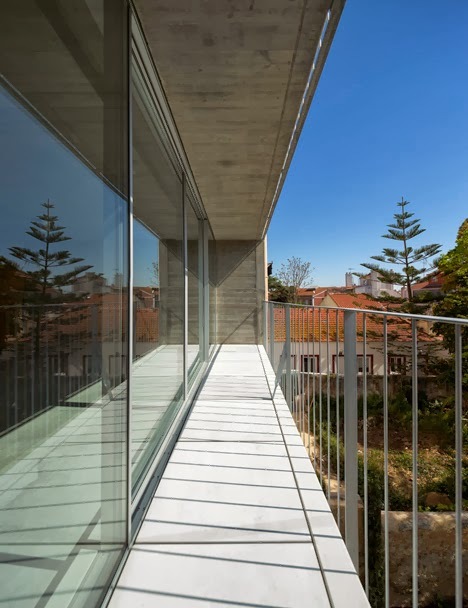 On the back elevation we have explored the extreme transparency which extends the interior onto the exterior and opens up the view to the garden - where a splendid Linden tree takes centre stage - leading the eyes from the top floors over Lisbon's hills, the Tagus river, and the South Bank. 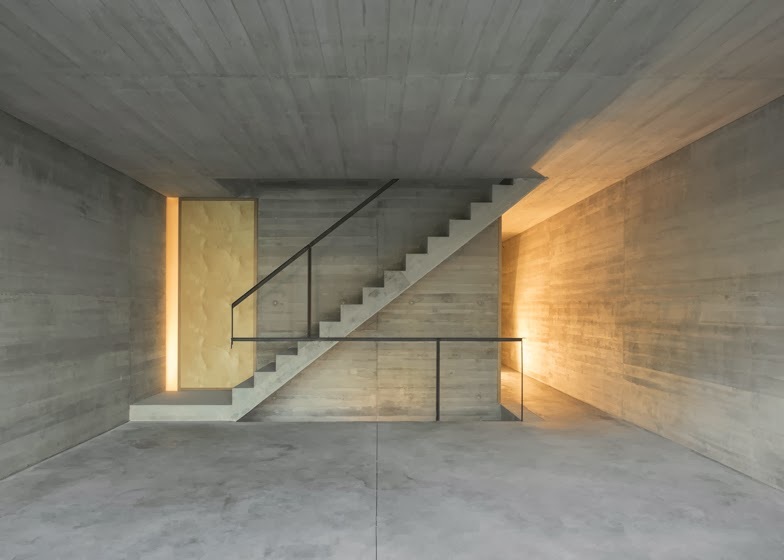 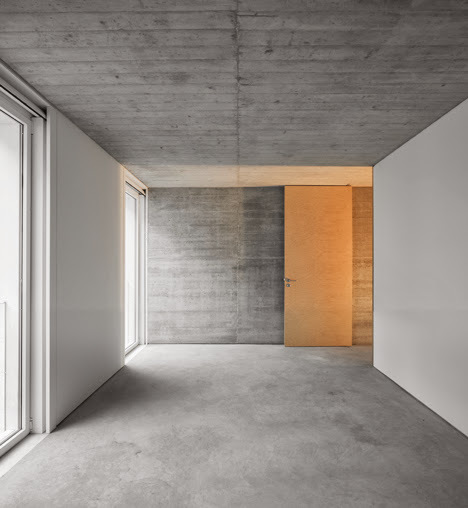 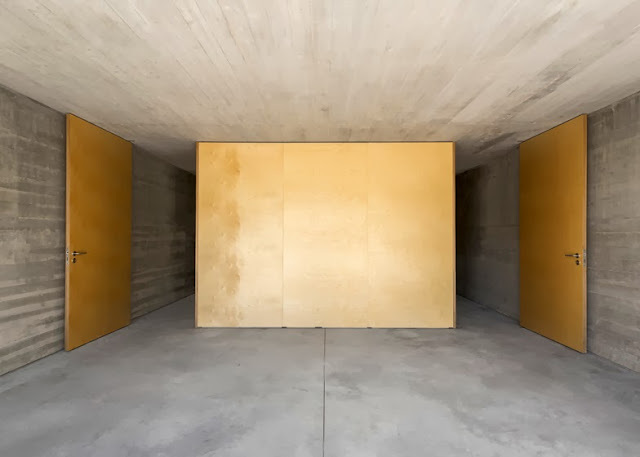 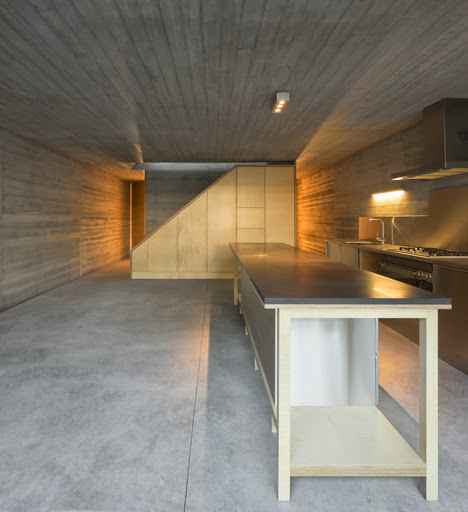 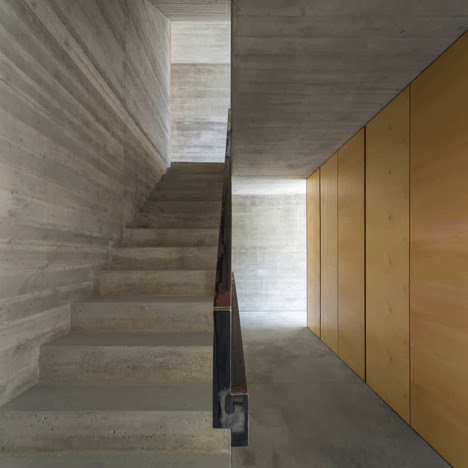 Radically opened to the exterior, the generous morning light that floods in directly is balanced by the grey concrete making up all the surfaces. Inside, the precision of the design, as well as the inclusion of two doors in most rooms, endows the five small floors with a sense of a generous space, and give its dwellers a strong feeling of fluidity and freedom. 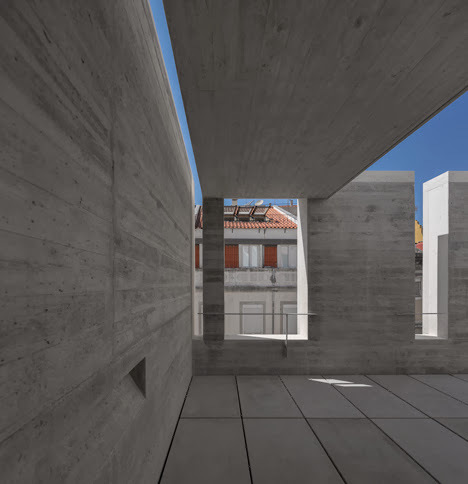 The constructive research for this project provides an example in which the whole structure shapes the space and becomes architecture in itself: the whole concrete structure, built with only 3 planes - two gables and a transversal plan - is set forth and designed to define the essential house space.